4.5 stars with 280 reviews. If you are still using one of those free Harbor Freight VOMs this is a nicer upgrade. Most important thing is that the continuity test beeps, so you don't have to look up. Tests batteries under load too. Has rubber boot to keep it from sliding around. Had an older version of this I used for about 15 years without any problems. Eventually it started giving off numbers for resistor values and I had to let it go. Upgraded to a nice Fluke but I have nothing but praise for the Craftsman brand. This is what I've been using for several years. 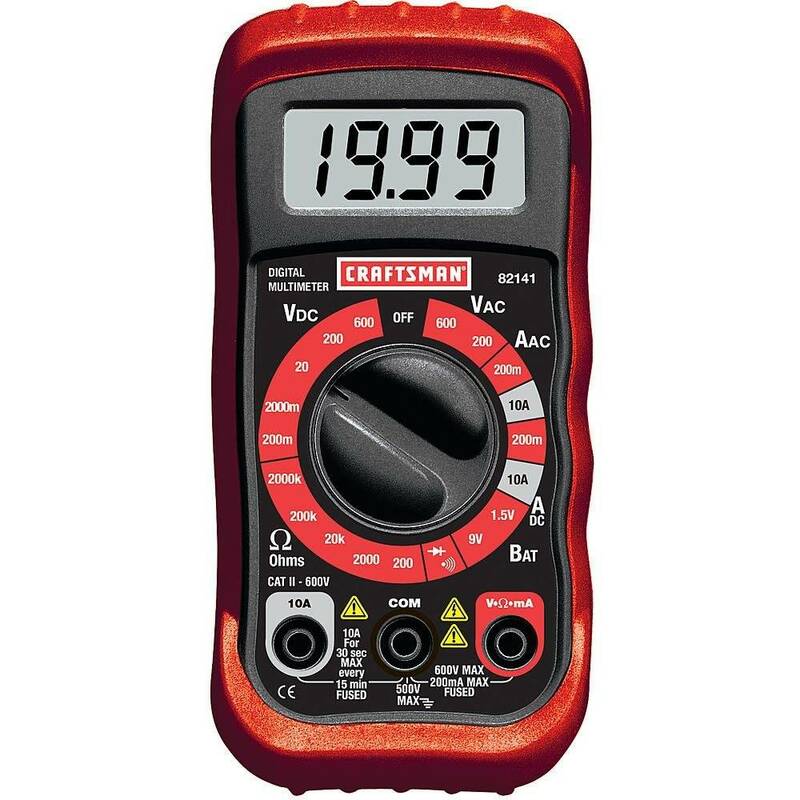 It's a nice inexpensive multimeter. I can finally dump my 30 year old Fluke and more up to an auto-ranging meter!!! Actually, I went to use my old Talking Radio Shack / Tandy DMM today to test my trailer lights for a break and the damn think went out. (not the batteries). I keep my Fluke on the bench but one of these should be in every trunk or mobile tool sack. I am serious about the Radio Shack being a talking version. I think I paid $20 for it $25 years ago. The red Positive probe has a button on it. So when you get the probes set in place you hit the button and this monotone male voice reads out "THREE HUNDRED VOLTS" or whatever. Cheap and funny, but surprisingly useful over the years. I think I paid $11 years ago. Still works great. Flukes are great, but when the keypad stops responding, you have to take apart a HF meter and steal the conductive zebra rubber from it. Most important feature in a multimeter: auto-shutoff when idle. The 9V batteries I've killed would fill a shoebox.